Bodega is a pan Indian club night that focuses on micro-genres from across the world. 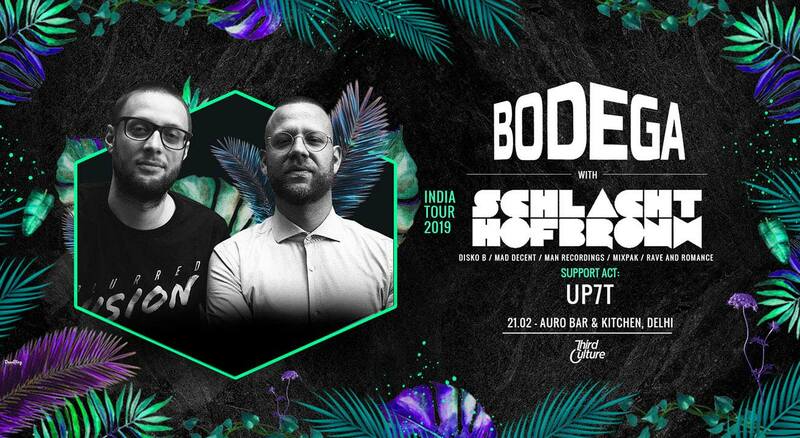 Ranging from Global Bass to Cumbia to Afrohouse to Baile Funk and everything in between, Bodega aims to introduce the Indian audience to new sounds that have perhaps not been highlighted before, by giving them their own night. The property will tour international artists who are leading proponents of these genres across major metros in India, bringing global sounds to your city. Combining great production a banging sound system, decor and international talent we hope Bodega will turn into your go to club night to discover new genres. The first edition features Schlachthofbronx, a duo consisting of Benedikt and Jakob from Munich/Germany who produce and play hybrid club music. Besides from being known as on point performers on club and festival stages, the guys also built their reputation with production and studio work with and for artists like Snoop Dogg, M.I.A., Major Lazer, Buraka Som Sistema, Bonde Do Role and others. In the club they deliver a fast paced, bass heavy mix of styles, reflecting their various influences reaching from Dancehall/Reggae via Booty Bass and Footwork to Techno and the UK Bass continuum. Their tracks get support on BBC radio as well as praise and spins from a wide range of fellow DJs and artists (like Modeselektor, Brodinski, Toddla T, Rob Da Bank, Diplo, DJ Hell, Mr. Oizo, Annie Mac, you name it).